The author of this article, Asfaw Yemiru, is one of Africa's most extraordinary men. At the age of 10, he was an illiterate beggar-boy on the streets of Addis Ababa. Today, aged 28, he is headmaster of a free school for over 3,000 poor children. Not content with this achievement, Asfaw is now moving his school towards a new concept of education which could have significance not just for Ethiopia but for many other parts of both the developing and the developed world. 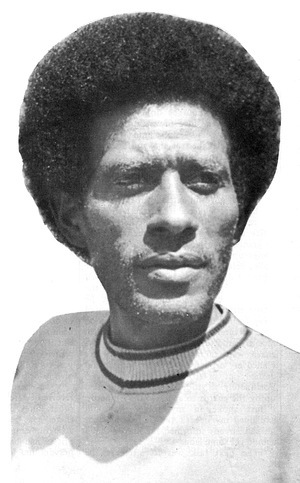 Asfaw Yemiru was born in a poverty stricken Ethiopian village. Attracted by the excitement of the city, lie left home at the age of 10 with 50 cents in his pocket, to walk the 120 kilometres to Addis Ababa, Imperial capital of Ethiopia. For a year lie lived in St. Georges' churchyard with the other street urchins, begging food in order to stay alive. Chance took him to work as a house-boy for a wealthy Turkish woman. He received no pay but was able to attend a local primary school. Completing the 8 year course in half the time, his outstanding 90% examination mark qualified him for one of the few free scholarships at the prestige General Wingate Secondary School. But at the last moment, Asfaw was told that his place had been taken by someone else:- "It was a common enough story - some rich man's son who had only scored 50% in the examination had been admitted instead of me". In this article, compiled from taped interviews with a former teacher at Asfaw's school, Kenneth King, Asfaw Yemiru takes up his own story. I thought I would try and go abroad for more education. It might be easier to get it there. So I just boarded a cattle train for the coast port of Djibouti. It took some three days to make the descent from the Ethiopian Highlands, but unfortunately when I got there, I was discovered and sent back forthwith to Addis Ababa. When I got back I came directly to see the headmaster of the Wingate School, which had been set up as a boarding school with British aid after the War. I explained my condition to him, and he told me to wait until the coming September, and he would put me in the school as a boarder and pay for me himself. By this stroke of luck I had the opportunity now of four years secondary education. However I decided I would try and combine this with doing something about the standard of the other people out-A side. I soon noticed that plenty of scraps were left over from the boys' meals at the school. The kitchen staff used to bury or burn them. t thought it would be good to give this to some of the people who were starving outside. And I thought especially of the cripples and beggars who used to cluster around the entrance to the Ethiopian Church which was just over the Wingate wall. With permission from the head of Wingate, I used to gather up all the scrap food and distribute it over the wall to anyone. Soon we began to concentrate on some of the younger people who were starving. I organized a system of permits which allowed a number of the poorest boys actually to come into the Wingate School compound when the ordinary students had finished their meals; and then they would have theirs off the scraps. That's all it was to begin with. Soon however these ragged boys and girls began to ask for education as well as food. I was still in the bottom grade of the Wingate School when 1 began to teach these ragged children on Sundays - just over in the church compound under some of the trees. I then altered this to teaching during the weekdays as soon as my own school day was finished, between 4.30 and 6.00. And to help out we managed to get a number of the Wingate students to come across and teach as volunteers. Quite a lot of them enjoyed doing this work for a few weeks, and then they began to think it was a terrible job, and felt that if they went on with it much longer they might endanger their own chances of doing well in their exams. The thing came to a crisis point when the church told us one day that the children would no longer be able to spend the night under the shelter of the church gallery. I was discussing with some of my friends what should be done about this, when I had the idea of writing direct to the Emperor and asking him for some land. They laughed at me and reminded me of the frog which tried to act like a lion. Anyway, I just wrote off, and was very surprised that he should answer me, saying that if there was a reasonable amount of government land in the vicinity I should get a piece. I had the letter, but the real difficulty was to get the mayoral office in Addis Ababa to agree eventually to granting me land. So to try and speed things up, I took advantage of a visit of Haile Selassie to the next-door Wingate school. I decided to chance the traditional practice of hurling myself in front of the Emperor's car, with the hope that he would listen to me before I was hustled away by his bodyguards. It wasn't a good time to intercede because there had been recently an attempted coup and the bodyguard were taking no chances. However I lined my orphans up by the roadside and dashed out in front of the moving car. Fortunately it stopped and I was hauled up by the guards to speak to the Emperor. I just spoke in my rough way and explained my needs. And he told me that he had already informed the mayor that I should get some land. The next task was to intercept the mayor. I used to go down town every day after school for months and I would wait outside the mayor's office. There was no question of his giving me an appointment. Instead, one had to do without supper, in the hope of catching his eye as he got into his car. The letter was held up with the mayor for almost a year, but I finally succeeded and the mayor passed it down to the district governor. Eventually, after I had pleaded with him too, I was awarded 300 metres of land up against the Wingate School wall. I decided that the land was enough to build about ten lean-to classrooms against the Wingate school wall. So with the money collected from our school plays, and with a gift of 800 dollars from the new headmaster of Wingate, Mr. Roydes, we built ten classrooms. I didn't divide up the classes thoroughly from each other; in fact the partitions were only waist-high, because at that time I wasn't sure if I would be able to get teachers, and thought it might be necessary for one teacher to be able to overlook three classes. So we began as a primary school and filled up the classes with the 280 children who had been learning earlier with me in the church compound. I didn't take any more during our first year. However, at the beginning of the second year, the classrooms were filled to overflowing, and there were still queues of people waiting for admission. 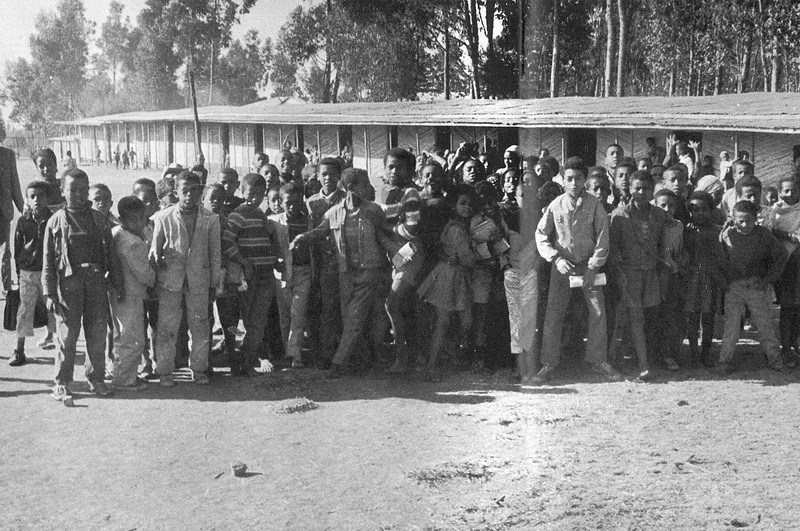 The school was entirely free, and it gained in popularity when the other primary schools in Addis began to demand that their children should have uniforms and put down deposits for all the textbooks they used. Soon, the pressures from more students had forced me to expand our facilities. I borrowed money from the local church, and with the help of my students managed to build two mud blocks of further classrooms, and a small brick house for myself. The original loan had come to 800 Ethiopian dollars and this meant that I somehow had to pay back the interest of 10 dollars a month. Again, I was very fortunate, because Mr. Roydes intervened to wipe out this debt, and remove the burden from me. By this time the school was up towards the 1,000 mark. It therefore became necessary to look for the official recognition of the Ministry of Education. In fact, I was not very anxious to become a government school headmaster. I have my own priorities in education, and I didn't want other people to come in and tell me what to do. My concern, from the beginning, has been with orphans and very small children. But if you become an ordinary government primary school, it becomes difficult for you to follow what you feel is best. Your own priorities might be destroyed. The first two or three teachers I received were only really able to keep order. They dated back to the time when there had been many boarding schools, after the Emperor's return from exile, and priests had been attached to these to say prayers and lead grace at meals. My ones couldn't read or write, and I just used them to keep the children orderly when I was short of good teachers. Still, I am glad that at least I get my own salary from the Ministry; it helps to cover the electricity and water bills. And in more recent years (1968 and 1969) I had several V.S.O. volunteer teachers from England in my school. Over the years I have expanded the school as I could. Without any regular finance I couldn't make any long term plans for building. But again and again I have received aid from some unexpected source just when I was thinking things would be impossible. For instance, Haile Selassie paid his second visit to the school just when I was deeply in debt to many people (including the Addis Ababa Municipality) for the running costs of the school, He promised he would give me 5,000 dollars to cover these. I used some of it for my debts, but most of it went into the building of an Assembly Hall. On another occasion, I was lucky enough to be given 6,500 dollars from the National Lottery (from the uncollected prize money), and with this I built four further classrooms out of concrete blocks. Then in 1969, when I was again quite desperate, I received some 2,000 dollars from abroad, a little of it from Sweden and the rest from my old friend, Mr. Roydes and from Winchester College. Finally in 1970, I was amazed to be summoned to the Palace and be informed that I had been awarded money from the Haile Selassie Prize Trust. This was 10,000 dollars. 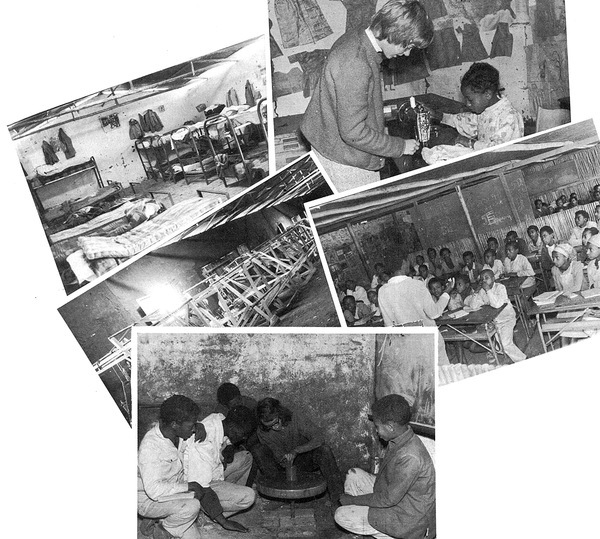 The older pupils teaching the young, a volunteer demonstrating a sewing machine, the looms which Asfaw built himself, the bunk beds in the orphans' dormitory, a lesson on the potter's wheel - everyday scenes at the Asere Hawariat School for the Poor. Looking back on the expansion that we have achieved with this money, 1 can see a number of trends. I have built 64 classrooms, and I have built them on the principle that education is more important than the building. The Ministry of Education has laid down its standards for primary school classrooms, which amounts to about 5,000 dollars per class. They have to be of cement or stone. Now, if I had followed those ideas, I would only have been able to build about ten in these last ten years, and maybe only have 400 pupils instead of my present 2,500. Instead, I have been able to put up all these classes, and in addition a library wing, store, kitchen, male and female sleeping quarters for the 380 orphans we now have. I made one mistake over that Assembly Hall, spending all those thousands on what I now regard as a foolish project. But otherwise I do nothing for prestige reasons. We do what is possible for the time being to meet the demands of the children. This may mean that people will say my children are working under mere shelters. But education is more important to me; and I feel that once the country is more developed, there will be plenty of opportunity to put up fine permanent buildings. But who are the students who make me add on these three or four new classrooms every year? Many of them come from far away, from outlying provinces where education is very poor. Not tong ago I got a message from a group of children in Bole province asking me to come down and bring them up to the school; their parents had been killed in the Ethiopian-Somalia conflict, and they had heard of my school from some friends. A great many pupils come also from the Addis Ababa area, and often they walk for 15 miles evening and morning in order to reach here. Other children now in the school come from the Mercato area in Addis, where it is possible to find maybe 80 children sleeping huddled up in one room without blankets, and paying the landlord 10 cents per night. So although I've got 380 orphan boys and girls who actually board at the school, a lot of the other children are also from broken-up homes, or far removed from their parents. You can't call this a community school therefore, because it doesn't serve one area, and doesn't have strong ties with the parents of the children. It's difficult to have much interest from parents when they hardly get enough income for their daily use - quite apart from finding time to visit the school. But I don't want children of rich parents in the school. Often they set a bad example and make for unfair competition. But because the school has a good reputation, a number of wealthy parents used to send their children here. As soon as I found out I expelled them. I'm concerned with the poor strata of society, and not with people who could afford to send their children to the Wingate School. It is still quite easy for a rich child to get into the school for a few days. I don't have any registration forms to ask them who their fathers are, what religion and tribe they are. I just take whoever applies to come, provided I. can see a case of need. And sometimes a rich child is able to pretend he is poor for a short time. In the first few years of the school, I built the grades right up to Standard VIII, when they take the qualifying exam for secondary school. And initially I was anxious that the school should do well in these results. 1 don't care about this at all now, but I used to take pride in the school getting the best St. VIII results in the country. We even had a scheme whereby one of our best boys was selected to continue his education in the Wingate School. This made a lot of our children anxious to enter this kind of school; but I now realize that going to the Wingate probably spoilt people like these. One boy in particular went through Wingate and is now in the University. But what's the result? He has become useless as far as helping out the people he came from. As I looked at my St. VIII leavers, I felt that most of them were failures. They were going after material city standards, and forgetting completely what they had been through. So in order to keep some influence on them, I built up the school to 12th grade. Some of these high school boys have been with me for years now. But as far as their schooling is concerned, I am quite clear that I'm not really preparing them for 12th grade entry to university. Personally I don't care whether any of them pass or not. I use them for important things like teaching in my adult extension classes and also teaching some of the lower grades in the school. However I have gradually come to think that in Ethiopia we can probably do without all this budget spent on secondary schools and university - at least for several years. There are enough corrupted students in the secondary and university levels already without me training up a few more. If we didn't have the influence of the secondary and university exams, we could do some real teaching in the primary schools. And we could start to do something about this gap between the `educated' and the children of poor people. Looking at my own old students and at the others in the secondary schools has made me change my direction completely in this school. Originally I had thought my pupils would be bound to be useful if I got them through exams and into jobs. And yet all the ones I thought would be best, and who would really try to do something for the country, have turned out to be useless - useless socially. They have become self-important and self-respected. They neglect where they come from, and begin looking down on people who have never been to school. I have decided therefore that I can only change this by making less of a gap between the graduating students and those without education. So now I am going to reduce the school to one which has only four grades or standards. I will take a large number of pupils through a basic four year course. My aim is to teach children enough in four years to prepare them for life outside, not just to pass examinations. In that period I have to teach them to understand the English and Amharic papers and be able to understand what is said on the radio. I don't just mean understand. I mean be able to interpret and be conscious of what is going on in this country. Through civics classes we try and make them sensitive to the goings on in the country. We look at subjects like land reform and the role of the police in the countryside. We look at the constitution. Then we compare what is going on in Ethiopia with other countries and continents. You have somehow to wake the children up so that they don't think that Ethiopian life and culture is perfect. Others of them have got to be introduced to what life is really like in other countries, otherwise they will remain stuck in their belief that they as poor children are destined under God to live in conditions of poverty like they have been doing. They are too ready to accept that this life has got to be as it is now. With the students in the school I have started what I call parent education: children should teach their parents or the other adults they live with. Otherwise they will not be promoted at the end of the year. So promotion is not just academic merit. It's been working quite well. The children have taught them certain basic things, and then we have sent out tests at the end of the year for the children to administer to the adults. Naturally some children may cheat and fill in the forms themselves. But You can't always be playing the headmaster and doubting the children's honesty, if you are trying to make them self-reliant. We're trying to get across the idea that if you have had free education yourself, that means you have to be ready to do something for other people without it. It won't be easy to make them all socially aware, but we have to make a beginning. So I keep pointing out to them that they are no different from the cleaners and guards in the school compound; it's just that they have been younger and luckier. With the orphan boarders, there is another sort of adult education. I have started an adult literacy school outside Addis, about 15km. away. My oldest orphans - about 23 of them - go up there on Saturday morning; they stay overnight and teach again on Sunday. Like our own school, we started teaching under the trees, and now we have rented an old house. I have a third type of extension programme down in Sidamo area. I have often talked to the students about the advantages of working in the countryside, and this time I took about 16 boys down there to work amongst the Gurage people. They collected all the older people of the area and taught them, and at the same time provided for themselves by growing vegetables. I just took them there as an experiment. We rented the land and they started. They too seem to have found what they wanted. They're happy there. In fact these experiments in the countryside make me unhappy about the present position of our school, right next door to a prestige secondary school. It's very difficult to convince people of graduating after Standard IV, when they see people living in luxury over the wall, and preparing to get office jobs in Addis. So to make it a little easier for the children who want a certificate, I am allowing some of the students to sit for the sixth grade qualifying examination. I don't care at all how they do. But it will be useful to some of the students to have a little paper certificate. Still, 1 feel that it's bad for our students to be so close to the town. I am interested in doing something different.for our children, and I think it will be easier if I move out of town about 20 kilometres. It will then be possible to have instruction in agriculture and work closer to some of the problems of the country. So that is the next move I am planning, if I can raise any funds. Many of the students won't like the change, but I have got to get them to see the priorities. Ethiopia is a poor country where far too much money is spent on the higher levels of education. Close this down, and then let the demands of the people open them up again once there has been a fairer spread of education at the lower levels. Really, I sometimes wonder what was the point of educating those old classmates of mine at the Wingate School, so that they could get jobs in offices. It's a waste of resources while out there in the district 'l was born there is no school at all. The soil is infertile and, they pay out their dollars in tax. Two dollars for each cow. So to avoid paying the tax, they have stopped having cattle. Education monies should put to right this kind of thing. Instead money is expended on expatriate advisors, who spend one year studying the situation, one year planning and the third year are replaced by new advisors. So nothing is changed and nothing is implemented. For the moment, in the present school, the majority of Standard IV will have to go. I shall pick out a small number for further education and training. I won't pick them on academic merit, because I have noticed that very often it is not the intelligent students who really care about aiding other people!